Found on the western slope of Mount Tamalpais, the Matt Davis Trail is a well known Marin Headlands trail that has a bit of everything. Over the course of this roughly 8-mile round trip you will pass over rolling grassy hillsides, through cool, dark, towering redwood forests, and down to the Pacific Ocean at Stinson Beach. From the Pantoll Ranger Station in Mt. Tam State Park to the Pacific Ocean at Stinson Beach is just under 4 miles. With varied and hilly terrain, it's not the fastest hike or run around, but it's definitely worth your time. Well before you reach Stinson Beach, you should have sweeping views of the water. Experienced hikers or runners can make a loop by combining the Matt Davis Trail with the Steep Ravine Trail and Dipsea Trail to create a truly memorable wilderness adventure. Or, simply do an out-and-back on Matt Davis for simplicity's sake. Regardless of what you choose, the variety of this area will keep you moving to see what’s around the next bend. There are many things that make the Matt Davis Trail such a well loved trail by locals and visitors alike. First, the drive to the trailhead is sensational. As you wind along the steep, curvy roads leading up Mount Tam, seeing cyclists huffing and puffing their way up, feeling the air getting cooler, hearing the sounds of the city fade away, and witnessing the ethereal views of the bay down below, you're blown away by the fact that a metropolis as large as San Francisco is just 25 miles to the south. Things only get better once you actually hit the trail. It begins with some mildly technical and exposed rocky terrain, but after a few hundred yards, you're thrust into the forest. From there, the trail becomes a soft, shaded path that is simply perfect for trail running — winding and weaving through picturesque groves of live oaks and Douglas firs. 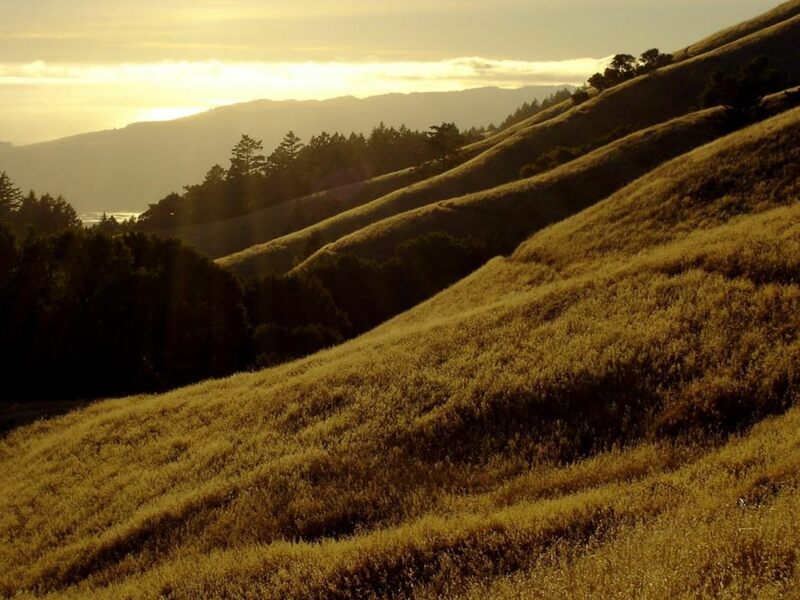 Eventually, you pop out onto the grassy golden hillside of Mount Tam. From here, not only are you rewarded with commanding views of the area, but trail runners can also enjoy a ridiculously fun descent. If you really allow yourself to get going, landing on your toes and trusting in your foot placement and ankle strength, you'll feel like you're flying — whipping in and out of more live oak groves as you descend. After this largely exposed descent, you'll soon enter a redwood forest, replete with everything there is to love about redwoods: soft soil, a carpet of ferns and mossy undergrowth, and of course giant, Ent-like trees. This section of the trail is where the real descent begins. You'll drop about 1500 feet over a fun switchbacked trail for about a mile or so until you pop out onto a neighborhood street in the town of Stinson Beach. If you want to put your feet in the sand, walk through the town until you reach the beach. If it's hot enough, take a dip in the ocean, but just know that you'll have a long, hard climb to get back to where you parked your car, so don't let your muscles relax too much. While hikers will certainly enjoy themselves, trail runners will probably take the most joy from this all-encompassing trail. It's an adrenaline pumping, endorphin inducing run, with smooth, fast trails (when not going up), and epic Marin Headland scenery. A tough, but totally worthwhile workout. What will you brag about? The hills. You'll either brag about how fast you were going on the downhills or how mentally and physically tough you were for making it back up to your car on the way back. You'll also brag about the stunning beauty you witnessed along the entire route. To access the Matt Davis Trail, park at the Pantoll Ranger Station. There are restrooms next to this parking lot. Just across the road, in the direction of the Matt Davis Trail itself is another smaller lot where you can also park. In the summer, the Pantoll Trailhead is popular and often crowded, so you may want to head out early or late to miss the crowds.